A suitable opposite number to the white statuario marble is Nero Marquina marble from the Vizcaya (Biscay) region in the Basque country, found in the Iberian Peninsula, once part of the Roman Empire which combines, in a refined way, a basic black colour with pronounced white veins. It harmonizes perfectly with the anthracite-grey titanium PVD coating of the cap and trim that gives an ever-changing appearance. The fountain pen is fitted with a ruthenium-plated 18-carat M nib, which matches perfectly the very masculine appearance of the barrel. The Black Edition is also adorned by an engraving of the Colosseum and a miniature Roman penny (denarius). An end-cap protects the rotary knob of the piston filling system. The edition is limited to 330 Fountain pens and 100 matching Rollerballs. The latest edition of the Pen of the Year tells a story of an epoch and people whose deeds made a strong impression on the history of mankind. It centers on an empire that, step by step from the 8th century BC, extended over three continents: Europe, Africa, and Asia. Even today, in the early Third Millennium, the Imperium Romanum still exerts immeasurable influence on our world. In the world of luxury, statuary stands for elegance and prestige. Fashioned of statuary white marble from Carrara, Italy, each individual pen is produced by hand. Inserted between the marble segments of the barrel are platinum-plated rings decorated with laurel wreaths, symbolizing fame and success, lending the pen inimitable elegance. Another unusual detail is the elaborately worked cap with an engraving of the Colosseum and a miniature Roman penny (denarius) as the crowning glory. The denarius in the cap is modeled on a very rare silver coin from the year 44 BC, depicting Caesar's head. The fountain pen comes with an 18-carat, bi-color gold nib, that is inscribed by hand, in sizes F, M, B and BB. A platinum-plated end-cap protects the rotary knob of the piston filling system. The edition is limited to 400 Fountain Pens and 120 matching Rollerballs. The revolutionary and pioneering construction of the Nordic longboats is the inspiration behind the design of Graf Von Fabe-Castell's Vikings 2017 Pen of the Year. The platinum-plated barrel is reminiscent of the elegant curves of those renowned boats; finished with masterly craftsmanship in the spirit of the epoch-making skill of the Vikings. With great precision, slivers of �curly� birch are integrated. A special process has made it possible to cut such thin pieces from this wood, which is very delicate on account of its attractive patterning. That takes a degree of skill otherwise found only in the cutting and polishing of gemstones. The warm color of the wood, full of nuances, harmonizes wonderfully with the carnelian that is let into the cap and glows an intense red. The result is a fascinating interplay with the cool metallic shine of the platinum-plated barrel, the name Graf von Faber-Castell engraved in the end piece in runes. The fountain pen features an 18K bi-colored nib, inscribed by hand. Limited to 500 fountain pens and rollerballs. Each piece is presented in an exclusive, brightly polished black wooden box with an attractive brochure and certificate of authenticity. The Graf von Faber-Castell Heritage Limited Edition pays tribute to Baroness Ottilie von Faber and Count Alexander zu Castell-R�denhausen, whose marriage created the new noble family �von Faber-Castell� and whose management spearheaded the success of the company into the 20th Century. They also renovated and expanded the Faber-Castell Castle in the early 20thcentury and the impressive design of the boudoir and study, its consummate craftsmanship and the intelligent and discerning personalities of Ottilie and Alexander, served as an inspiration for the luxurious fountain pens of this limited collection. Small movements or changes in the light cause the finely engraved green-lacquered metal barrel of the Alexander Limited Edition, and the Countess�s favorite color, violet-lacquered barrel of the Ottilie Limited Edition, to shimmer in varying shades. The elaborately worked fountain pens exude classical elegance with a hint of nostalgia that combine only the finest materials. All the metal parts are solid silver, and the hand-engraved nib is of 18 carat bicolor gold. The end of the fluted cap is embellished with double knurling, which is characteristic of Graf von Faber-Castell writing instruments in sterling silver. The intertwined initials A, O, F, and C � the first initials of Alexander, Ottilie and the shared family name Faber-Castell � are engraved on the end of the cap in fine filigree work of the utmost precision. The decorative ring on the cap bears the inscription �Handmade in Germany�. Finally, the name of the collection, �Limited Edition Heritage�, is engraved on the end piece along with the number of copies produced: 1898 � referencing the year 1898, the year in which Ottilie and Alexander married. Each fountain pen is enhanced with an 18kt gold nib, available in M, F, XF and B. Cartridge/converter fill. The Pen of the Year Edition has carved out a special position for itself with connoisseurs of fine writing culture due to its meticulous craftsmanship. Graf von Faber-Castell is very pleased to have the expertise of true artists of their craft for the design work of the Pen of the Year 2016 . The design is inspired by epoch-making works and personalities. In recent Editions, after Catherine the Great with Catherine Palace in St. Petersburg and Frederick the Great with Sanssouci, Potsdam , the trilogy is now complete with Empress Maria Theresa with the 2016 Edition - Sch�nbrunn Palace, Vienna . A significant inspiration for this year�s design is the black, masterly painted lacquer placed in paneling made from flamed maple and set with a gilded frame that has adorned the Palace�s Vieux-Laque Room since 1770. Here you will find a special expression of the deep love between Maria Theresa and Francis Stephen, in craftsmanship perfected over thousands of years � Lacquer Art, this story being the inspiration for the Pen of the Year. 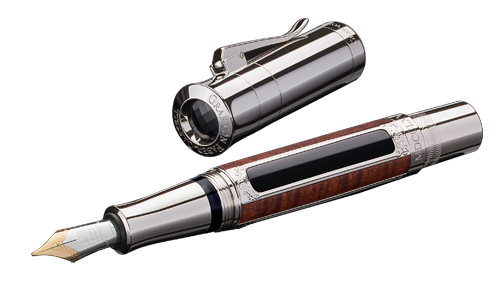 The Platinum-Plated fountain pen is limited to 500 units and the rollerball pen to 150. The Gold-Plated Special Edition is limited to 120 fountain pens and 50 rollerball pens. The individually numbered writing instruments are offered in a highly-polished, black wooden case. It includes a certificate personally signed by the master craftsman of the gemstone manufactory Herbert Stephan attesting to the authenticity of the onyx used. Artist Tomizo Saratani also attested to the painting with 24-carat gold. Handmade in Germany. Fountain Pen - Click "E-mail Prices" Rollerball - Click "E-mail Prices"
The New Graf Von Faber-Castell Limited Edition Classic Snakewood collection combines the natural and warm charisma of wood with the cool elegance of platinum in a most alluring way. The special grain to which the reddish-brown veined Snakewood owes its name is a magical feature - the wood is among the most expensive in the world and is prized in making musical instruments and other works of art. Fluted metal cap, spring-loaded clip and tapered grip are plated in precious platinum. Equally impressive are the capped rollerball, twist ball pen and 0.7mm pencil. With reference to the year 1761 when Faber-Castell was founded, this exclusive series is limited to 1,761 pieces of each mode worldwide. Presented in a handsome dark brown wood box. The fountain pen is enhanced with an 18kt gold nib, available in M,F,B,XF. Piston Fill. Its platinum-plated barrel and cap are adorned by four green Silesian serpentines and a Russian smoky quartz � both ground and polished by hand. The special edition combines 24-carat gold plating with green serpentine and rare chrysoprase, Frederick's favorite natural stone. Chrysoprase has not been mined for many years and is only available on the antique stone market. The special edition is limited to 150 fountain pens and 30 rollerball pens. The Platinum plated fountain pen is limited to 1,000 units, the rollerball pen to 300 units. Each writing instrument is individually numbered and comes in a highly polished, deep-black wooden case. It includes a certificate personally signed by the manufacturer Herbert Stephan attesting to the authenticity of the natural stones. The wooden case can also be used as a collector's case because a second insert has room for an additional six writing instruments. After its painstaking restoration, the Agate Pavilion, which is part of the world-famous Catherine Palace in St. Petersburg, is finally revealed in all of its splendour and multi-faceted beauty. Its architecture and materials were the inspiration for the new limited edition Pen of the Year . This magnificent building in the style of a Roman bathhouse was built by order of Empress Catherine the Great and completed in 1785. The Agate Rooms, which are masterly decorated with precious stones, is housed on the upper floor. These state apartments are covered with dark-red jasper, which can only be found in Russia. Its white flecks are also known as �blood agate� which is why the entire building complex is called the �Agate Rooms�. Under the direction of master craftsman Boris Igdalov, the workshop of Zarskoje Selo/Puschkin was able to complete the feat of restoring the Agate Pavilions in September 2013. Igdalov was personally involved in the creation of this year�s Pen of the Year in that he expertly created a master work by hand in two different, exclusive versions. Both fountain pens have red-brown, lustrous jasper in common. In order to impart the colour and character of the stone, the filigree detail is cut in the finest plates and meticulously ground. Multiple polishing reveals the desired light nuances and its noble surface gloss.Three large, mottled jasper pieces are embedded in the lavishly embellished platinum-plated barrel. The cap of the fountain pen is adorned with a grey, shimmering, Russian quartz with a facet finish. The number of available pens is limited to 1000. The Special Edition with 24 carat gold plating is limited to 150 pens. It is highlighted by small black plates with an inset gold rosette with six beautifully marked jasper stones. The cap as well as the end-cap are adorned with two sunshine yellow, Russian quartz stones with a twinkling facet finish. This extremely luxurious combination perfectly captures the magnificence of the pavilion of Empress Catherine the Great. Inscribed by hand, the 18 carat bi-colour gold nib is available in sizes F, M, and B. A platinum-coated end-cap protects the rotary knob of the plunger mechanism. The individually-numbered fountain pens are kept in an exclusive, deep-black wooden case that can be used as a collector�s case since it has space for six additional pens. It includes a certificate personally signed by Boris Igdalov attesting to the authenticity of the Russian gemstones. The Special Edition with 24 carat gold plating is limited to 150 pens. It is highlighted by small black plates with an inset gold rosette with six beautifully marked jasper stones. The cap as well as the end-cap are adorned with two sunshine yellow, Russian quartz stones with a twinkling facet finish. This extremely luxurious combination perfectly captures the magnificence of the pavilion of Empress Catherine the Great. Inscribed by hand, the 18 carat bi-colour gold nib is available in sizes F, M, B and BB. A platinum-coated end-cap protects the rotary knob of the plunger mechanism. The individually-numbered fountain pens are kept in an exclusive, deep-black wooden case that can be used as a collector�s case since it has space for six additional pens. It includes a certificate personally signed by Boris Igdalov attesting to the authenticity of the Russian gemstones. 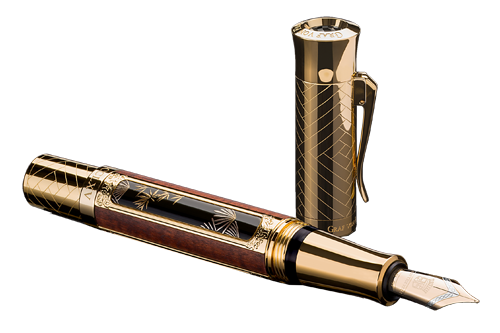 The Special Edition with 24 carat gold plating is limited to 150 pens. It is highlighted by small black plates with an inset gold rosette with six beautifully marked jasper stones. The cap as well as the end-cap are adorned with two sunshine yellow, Russian quartz stones with a twinkling facet finish. This extremely luxurious combination perfectly captures the magnificence of the pavilion of Empress Catherine the Great. Inscribed by hand, the 18 carat bi-colour gold nib is available in sizes F, M and B. A platinum-coated end-cap protects the rotary knob of the plunger mechanism. The individually-numbered fountain pens are kept in an exclusive, deep-black wooden case that can be used as a collector�s case since it has space for six additional pens. It includes a certificate personally signed by Boris Igdalov attesting to the authenticity of the Russian gemstones. Scarcely any other wood expresses such an enigmatic beauty as ancient wetland oak wood. It takes thousands of years for an oak tree to turn into such a sought-after and precious wood. Its deep, often gnarled textures make wetland oak look like driftwood found on the shore. But, in fact, these extraordinary pieces of wood have been buried for as many as 8,000 years in German bogs and marshes. The discovery of each find is a matter of chance and each piece seems to have a mysterious story to tell. No metal has fascinated mankind across centuries and continents as much as gold has: people have decorated themselves with it and fought over it. Its very name is synonymous with value and sovereignty and it expresses both power and love. At the beginning of the modern age it was one of the key driving forces behind the great voyages of discovery as people searched for El Dorado, the legendary land of gold. After studying old Venetian gilding techniques and winning the Bavarian State Design Award, the gilder and church painter Ernst D. Feldmann has achieved the almost impossible: layer upon layer of 24-carat gold leaf is applied to the oak pen barrel in an intricate and detailed process. Embedded in resin, this reveals a unique pattern of reflections that only the purest gold can display. A fascinating encounter: the deep structure of ancient wetland oak, whose beauty has been naturally wrought over thousands of years, together with gold, that lends a supernatural sheen to the most beautiful works of art created by mankind. A sensitive and masterly touch is demanded, if gold leaf is to mould perfectly to the graining of the oak barrel of the pen. The gold leaves are carefully applied by hand using a fine squirrel-hair brush. A 4,000 year old technique is used that dates back to the Egyptians and is mastered by only a select few people today. Such an extraordinary craft demands particular artistry and skill. The combination of gold leaf and ancient wetland oak makes the Pen of the Year 2012 an extraordinarily luxurious fountain pen. The 18 carat bicolour gold nib is available in line widths M, F and B, each one *run in* by hand. The end cap protects the twist knob for the filling mechanism. All metal fittings are 24-carat gold-plated. The masterpiece is crowned by a chessboard faceted citrine gemstone set in the cap. Each individually numbered writing implement comes in an exclusive deep black wooden case. A certificate, signed personally by Ernst D. Feldmann, attests to the 24 carat, leaf gilding on the thousands of year old German oak wood, as well as to the edition limited to 1500 fountain pens. The high-gloss collector*s case with glass lid and two removable trays made of linden wood provides a masterly setting for any collectors favourite pens. Bringer of luck, symbol of power, elixir of immortality � jade has always been surrounded by a special aura. From the earliest times, advanced cultures created jade objects of fascinating variety. The great jewellers of the Art Deco period discovered jade for their luxurious creations. Before then, the Russian goldsmith Faberg� � famous for his opulent jewelery � had already created artistic desk utensils from jade. That unique symbolic and creative energy naturally predestined the green gemstone for a special role in celebrating Faber-Castell�s 250th anniversary. Eight segments of jade symbolize the eight generations that have made their mark on the family firm to date. In reference to the year when the company was founded, this exclusive edition is limited to 1.761 pens. In China, no other stone was or is valued so highly. In a tradition that developed over the millennia, Chinese craftsmen advanced the working of jade to perfection. Revered as the stone of the gods, jade was reserved for kings and emperors. The link between the gemstone and the display of power and authority found perfect expression in the mythical jade emperor Yu Di. The oldest Chinese dictionary defines jade as �beauty in stone with five virtues�: human understanding, modesty, wisdom, justice, and courage � virtues that should still determine the way we treat people. Jade is remarkably hard and resists efforts to work it � a fact that has inspired craftsmen through the ages to supreme feats. Extraordinary skill is required to bring out the astonishing qualities of this gemstone. The Pen of the Year 2011 uses Russian jade. This emerald-coloured nephrite is delicately mottled; its deep green exhibits some appealing shadings. The jade is found in Siberia, but the exact location has always been one of the dealers� best-kept secrets. Even today, the hunt for jade is something of an adventure. Numerous processing steps are required before a piece of jade can be inserted into the Pen of the Year. From the first slice of the raw stone to the final polish, the craftsman must recognize its unique nuances and bring out jade�s natural gleam. Only very experienced jewellers can achieve that. None but a genuine artist can master the cuts typical of jade. Piece by piece, he chisels out a masterpiece in stone. 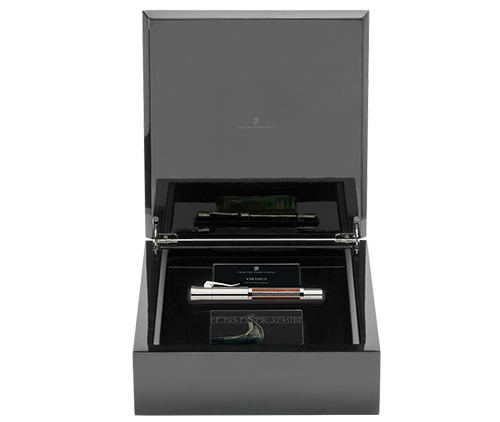 A platinum-plated frame encases the individual pieces of jade, making the pen a special piece of jewellery. The elaborate faceting of the stones on the barrel and cap is the crowning glory of the Pen of the Year. Immaculately faceted and polished, the jade is given its final and perfect form by a master craftsman of the Stephan gemstone laboratory. He is backed up by the long tradition of the Idar Oberstein workshops, that were set up in the 15th century and now enjoy a world-wide reputation. 2010 Pen of the Year Limited Edition...a secret art with highly aesthetic results. For the Pen of the Year 2010, Faber-Castell has returned to a process for which very few workshops still have the skills: the gunsmith�s art of case hardening. Founded in 1761, the Faber company developed into the leading manufacturer of wood-cased pencils which created a series of fascinating products that set standards to this day. The uncompromising awareness of quality, the innovative drive, and the social commitment of past generations form the basis of the company�s dealings to this day. It is now headed by Count Anton W. von Faber-Castell, the eighth generation of his family. Count Roland von Faber-Castell, the father of the present Count, was a passionate huntsman. The aesthetic appeal of some very valuable hand-crafted hunting rifles, owned by Count Roland, inspired the Pen of the Year 2010. On seeing the new pen one immediately notices the case-hardened metal parts and the fine engravings. Until the late 19th century, case hardening was the sign of a fine gun, with the inimitable shimmering coloration it provides. For centuries, the technique was handed down by word of mouth and was something of a secret art. The iron parts are usually packed in carbonized leather and heated to convert the surface into steel; the fine nuances of colour appear on quenching. Only recently has it been discovered that some 20 parameters contribute to the beautiful visual effect, including the thickness of the metal, the temperature, and the rate of cooling. With long experience a craftsman can influence the results but never predict them precisely, so no two case-hardened items are identical. The character of the case hardening is emphasized by elaborate engraving and a 24-carat gold inlay, inserted by hand. Nowadays there are only a very few traditional workshops that can carry out these ancient skills in the way that the Pen of the Year 2010 demonstrates. In addition, the material of the barrel of the pen fully matches up to the claim of exclusivity: it is the valuable wood of the Caucasian walnut. Seasoned for many years, walnut wood is tough and inelastic, with fine but marked patterns: it does not warp or splinter� the ideal wood for the stock of a gun � and for very special writing implements. Valuable too as it is not enough to fell the trees: the stumps have to be dug out, because the best figured wood is in the roots that go deep into the ground. No other tree warrants this time-consuming excavation. The valuable wood of the barrel and the splendid metal parts make the Pen of the Year 2010 an exclusive and individual fountain pen. The 18-carat bi-colour gold nib is available in - F, M and B widths. The platinum-plated end cap protects the knob for the plunger mechanism, on which each pen is individually numbered. A Near-Forgotten Art....Few creatures have inspired people�s imagination as much as the horse. Stone Age cave paintings preserve it in lively color; many deities are depicted on horseback, some even in equine form. The winged steed Pegasus brought thunder and lightning to Zeus as an insignia of his power, and in reward was immortalized as a constellation in the heavens. The wondrous mane and tail of a horse are not just naturally beautiful but also to withstand the elements. Towards the end of the 18th century, horsehair began to enjoy a high status as an elegant material for chair coverings. At first it was woven exclusively by hand, but in 1872 the first mechanical loom for the coveted material was constructed. Its natural properties and the difficulty of processing mean that horsehair is still used for extravagant furnishings and luxurious fashion accessories. The barrel of the Pen of the Year 2009 is woven in exquisite quality from horsehair. The weave is done individually, hair by hair, by Dorit Berger, the only person in Germany who still weaves horsehair by hand. This platinum-plated, individually numbered, magnum sized fountain pen fills via a special plunger action mechanism and will be produced for just 12 months. The 18 carat, bi-color nib is available in medium, fine and broad widths. The elaborate craftsmanship make each Pen of the Year 2009 a unique work of art. but leave some organic structures in part as they are. In an environment rich in silica, petrified wood can then develop into a preliminary stage of the semi-precious stones chalcedony or agate. Only Brazilian deciduous wood fulfills the high quality requirements for use as barrel material in the Graf von Faber Castell �Pen of the Year 2007�. Select stocks of this petrified wood have a very rare, dark coloring and are hard enough for a gemstone finish of the highest quality. The individual color hues vary from light brown, through elegant anthracite, all the way to a deep black that allows only a hint of the grain to be discerned. Only the sensitivity of experienced gemstone polishers ensures that the unique nuances of the �stones� are shown to advantage, from cutting the hard rough stone to the masterful precision cut all the way to the final mirror finish. The master craftsmen of the world famous Herbert Stephan Gemstone Manufacture were predestined for this demanding task. Their logo embossed on each pen insures the genuineness of the fossil material. The platinum plated metal frame encases each one of the eight stones and shows off their unmistakable brilliance to best effect. The exciting combination of two materials that are so different is a unique visual and tactile experience. This individually numbered, magnum sized fountain pen fills via a special plunger action mechanism and will be produced for just 12 months. The 18 carat, bi-colour nib is available in medium, fine and broad widths. The elaborate craftsmanship and the individual coloring of the barrel make each Pen of the Year 2007 a unique work of art. Nature and environment have always been an important part of Faber-Castell � for 245 years they have been the world�s most prominent player in the manufacturing of wooden pencils. This year, in honor of Henry David Thoreau and the Walden Woods Project, Faber-Castell presents a limited edition rollerball made from historic ash wood salvaged from naturally fallen trees in Walden Woods. A quotation of Mr. Thoreau is etched in his handwriting on the barrel. Platinized metal caps and grips provide the finishing touches to the individually numbered, limited edition rollerball. Faber-Castell has embraced the message of Henry David Thoreau, who lived in solitude at Walden Woods for over two years. His reflections of that experience resulted in his book Walden, or Life in the Woods, which served as the root of the American environmental movement and the notion that ecological and economic interests can be balanced. The cooperation of Faber-Castell, the American Forests Trust and the Walden Woods Project is living proof of this ideal. For each limited edition fountain pen sold, a new tree will be planted in Walden Woods. Through conservation, education and research, the Walden Woods Project preserves the land that inspired Thoreau and applies his philosophy to foster environmental literacy and stewardship.Cartridge/converter fill. 18 kt gold nib. Nature and environment have always been an important part of Faber-Castell � for 245 years they have been the world�s most prominent player in the manufacturing of wooden pencils. This year, in honor of Henry David Thoreau and the Walden Woods Project, Faber-Castell presents a limited edition rollerball made from historic ash wood salvaged from naturally fallen trees in Walden Woods. A quotation of Mr. Thoreau is etched in his handwriting on the barrel. Platinized metal caps and grips provide the finishing touches to the individually numbered, limited edition rollerball. Faber-Castell has embraced the message of Henry David Thoreau, who lived in solitude at Walden Woods for over two years. His reflections of that experience resulted in his book Walden, or Life in the Woods, which served as the root of the American environmental movement and the notion that ecological and economic interests can be balanced. The cooperation of Faber-Castell, the American Forests Trust and the Walden Woods Project is living proof of this ideal. For each limited edition rollerball sold, a new tree will be planted in Walden Woods. Through conservation, education and research, the Walden Woods Project preserves the land that inspired Thoreau and applies his philosophy to foster environmental literacy and stewardship. Some materials were meant to be married, and so it is true with the black and white perfection of ebony and ivory. The dark brown, nearly black heartwood contrast-frames the creamy white of the raised guilloche ivory inlay. The polished Mammoth ivory disc set into the end cap reveals the typical texture of ivory from the outside. Since mammoth ivory absorbed moisture during the millenia it was buried in arctic ices, it has been carefully dried for 5 years to prevent cracking. Each 2006 limited edition bears an 18k bi-coloured 18k gold nib, a spring-loaded solid metal clip, and a platinized end cap to protect the knob of the plunger mechanism. Each is individually numbered and enclosed in an exclusive ivory-coloured wooden case along with the personal signature of master craftsman J�rgen Schott, attesting to the quality of the ivory.